Denver Mayor Michael Hancock joined Ford engineers, executives and others involved in the EV industry to welcome the new Ford Focus Electric to Denver today and a brief drive revealed both more-than-adequate acceleration plus a quiet, agile and smooth ride from the 110-MPGe vehicle. “Not being a coastal city, it is huge for Denver dealers to be receiving this car next week,” Mayor Hancock said. He went on to say the advent of the electric car places America on the brink of something as big and life changing as the internet was so many years ago. Electric cars are just one aspect of Ford’s approach to the modern automotive market was the message Julie Roehner, Ford Vehicle Integration Supervisor for Electrified Products, delivered to the assembled media as she touted the accomplishments the new Ford Focus Electric represents. First, with its EPA-certified mileage equivalent of 110-MPGe, it is the world’s most fuel-efficient, five-passenger vehicle, though it may not be the roomiest five-passenger vehicle. Those five people can’t ALL be tall, leggy or obese and still fit. Next, Ford has managed to produce a range better than the Nissan Leaf in a heavier car, with a smaller battery in the new Ford Focus Electric. It can travel up to 76 miles on a full charge, three miles more than the Leaf. Third the new Ford Focus Electric can recharge in as little as 4 hours with a 240-volt charging connection or overnight on a standard 110-volt outlet. The front wheel drive vehicle’s all-electric powertrain and single-speed transmission provide responsive, smooth acceleration and a top speed of 84 mph. It drives a lot like the fuel-powered Focus five-door hatchback that forms its basis – only quieter. We used the navigator to see how it would compute the range within its turn-by-turn instructions, plugging an address in Colorado Springs into the navigator. It asked if we would be recharging at our destination – we responded in the affirmative – before the navigator revealed it was 69 miles to the designated site and our range was 70 miles. Roehner explained we would have to drive conservatively in route, though at up to 70-mph, to arrive at the destination within that margin. Given a 15 to 25 mile margin to your destination, it would allow you to drive the car more aggressively as long as you planned to recharge before returning. 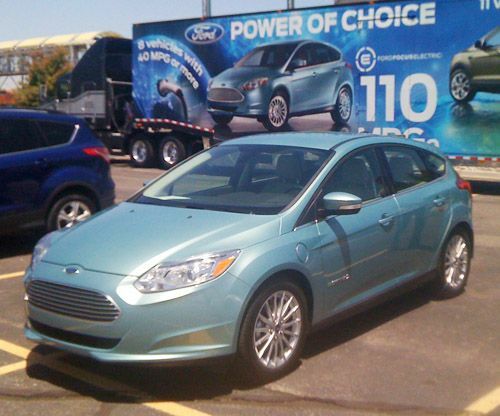 The new Ford Focus Electric has a 141 horsepower motor (105kW) and develops 188 lb.-ft. or torque. It uses a heated and cooled 23 kWh lithium ion battery manufactured by the Piston Automotive Group. It is a zero-emissions vehicle which entitles it to Federal Tax Credits and any applicable state credits – Colorado is one of few states to have enacted such, which probably explains why this is the first market away from the coastal cities that form America’s Electric Smile. It features MacPherson Struts up front, and Control Blade multi-link rear suspension with disc brakes all around, and sporting a four-sensor, four channel anti-locking system. It runs on 17-inch aluminum wheels sporting P225/50R-17 tires. The new Ford Focus Electric is just under 14.5 feet long with a wheelbase of 104.3 inches and a curb weight of 3,624 lbs. Weighs more, has a smaller battery and still gets three more miles on a charge than the Leaf – brilliant and part of Ford’s all-electric lineup. They also are bringing a full court press of choices to the market with full and plug-in hybrids, in addition to EcoBoost engines in 11 of their vehicles as well as Flex-Fuel and CNG options in others. One of the unique ways in which the new Ford Focus displays its green badge is via butterflies on a screen next to the speedometer. This lead Denver Mayor Hancock and Colorado Governor John Hickenlooper to compete to see who could rack up the most butterflies, when they drove the new Ford Focus Electric earlier today, the Mayor said. Roehner said her daughter implores her to, “Stop killing butterflies!” when she notices her depressing the accelerator too aggressively. This could well become the rallying cry of the electric revolution on the green streets of our urban areas. Butterfly stompers, you have been warned! This car is great. Comfortable to sit in and nicely outfitted. The trunk is extremely limited and the rear seats don't seem to fold down, however, so cargo is an issue. Still, for its class, it's a fun little commuter and it puts out a lot more umph than you'd expect if you haven't driven an EV. I loved the car. I test drove it two weeks ago and was very impressed with it. I test drove all the mules and prototypes until now but this final product really impressed me. You're right, they bettered the Leaf and upped the ante with a beefier onboard charger. What impressed me most is how tight the car felt. Considering it wasn't build grounds as an EV, it felt like one. The best part about the introduction of the Focus Electric is that Nissan and Mitsubishi are saying they will also upgrade their onboard charger to match Ford's 6.6 kWh one. Finally, there is competition!